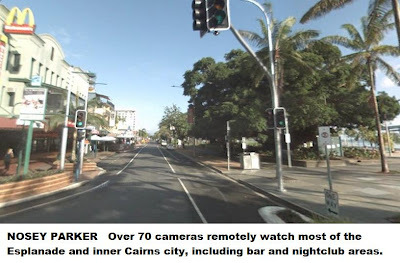 As many German tourists visit Cairns, it is timely to state that such cameras are illegal in German streets, although they are installed in shopping malls. Germans tend to object to such surveillance measures. In Berlin, for example, where there are few cameras on public transport, the windows have been scratched beyond recognition. Yet the locals seem to prefer this to the option of having CCTV everywhere. Finally, there is currently a massive protest within Germany concerning Google's current roll-out of 360 degree street photos. 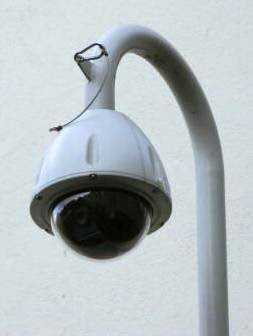 My bottom line is that I suspect German tourists would tend to find Cairns' CCTV cameras in streets objectionable. The mere fact that some city Councillors (a CBD one!!!???) could have access top CCTV images,.. is a real worry!!!!!!!!!!!!!!!!!!!!!!! Mike, what did the city of Wellington do at night? Surely they wouldn't have kept their "City Safe Community Staff" working at night? Incidentally, I think having a few "city safe" staff patrolling the streets of Cairns, offering assistance to visitors etc like they have at the International Airport, is a good idea. Tourists need to know things like where are the public toilets, bus terminals, taxi ranks, nearest medical, dental surgery, money exchange etc. Locals also need assistance with directions! Yes Alison, CitySafe officers council-employed in Wellington, work in tandem with local police and security. They carry communication devices to relay trouble and highlight areas where police or other assistance are required. SO in addition to a tourist-visitor-friendly street helper... they perform a valuable role with real eyes-on the streets, something that cameras will never do. Mike, I'm sold on the idea. When I worked in the public service, our union innovated with a position similar to that of a "major domo"...a person who greeted clients, sorted out simple enquiries, helped invalid and disabled people, mothers with babies, directed people to toilets, told people to behave themselves etc. This resolved so much of the angst and conflict we customer service officers had been receiving. There is nothing as good as people skills!! No matter how sophisticated a piece of technology is, it cannot replace a human being in interacting with other human beings. I wonder if this idea therefore could be passed on to the CRC, or is it now much too late? Nice manipulation, Mike. Use of words "perve", "snooping" and other opinionated descriptions. I see nothing in what Cr. Forsyth has said that suggests we should abandon cameras. And while you insist the cameras don't "solve" crimes you then cite an incident where a street pee-er is prosecuted, and don't bother to get any rebuttal from the QPS. Another manipulation. I decline to be manipulated. Bring on the cameras! Interesting how CBD Warrior cherry picked Mike's comments and ignored mine about the helpful, friendly interactions that people do which technology cannot do. So much of British TV crime plot writing is based on the ubiquitous use of cameras. (Was reminded of this when I watched the Bill last pm on ABC Iview). Though apparently, less than a third of the cameras in the UK work at any one time). The existence of cameras absolutely everywhere saves the UK cop plot writers a lot of time, hassle - and creativity. The inevitable availability of camera footage enables tremendous and lazy leaps in sleuthing (compared to Sherlock Holmes with his valiant magnifying glass - also showing on ABC Iview). So if cameras were installed everywhere in Australia, Australian cop plot writes may lose some creativity. Even if the cameras mostly don’t work here either. I remember back when they started installing cameras the CBD it was unsafe to walk even a single block in the CBD at night - gangs were roaming the street bashing people unconscious and robbing them - having people on the streets is a great idea but it won't stop the violence as effectively as the cameras have. There are already lots of police and security out there at night, in addition to security posted outside the licenced premises. City Gal on the Esplanade said "The mere fact that some city Councillors (a CBD one!!!???) could have access top CCTV images,.. is a real worry!!!!!!!!!!!!!!!!!!!!!!!" That's scary and hell, no... Imagine what they might think up to sue us all for next? I doubt we need worry about being sued by a certain councillor because of CCTV footage - watching it would eat into time enthralled at the mirror. I say we stop wasting tax payers money and make the cameras redundant by shooting the [removed] bastards who are bashing everyone in the first place. How will we know which bastards to shoot without the cameras? I have seen bastards of all skin colours, as well as fat, skinny and average sized bastards fighting in the city. I've seen straight and gay bastards fighting - some may have even been bi-sexual. I'm not sure of the political persuasion of various fighters and it never felt safe to ask. I have seen an awful lot of Irish bastards fighting, but if we just shot all the Irish bastards, the Japanese bastards I've seen fighting would have open slather. Perhaps we should just shoot the stupid bastards but then my post would be perceived as mocking the dead. I see that this roll-out has occurred all over the state. Precisely which body is responsible for their installation: is it the police themselves? Or some other state government department? Or is ot the council? I suspect that in Cairns hardly anybody looks at them. Needless to say, following an incident, valuable evidence is there to see. Yet once again, it amazes me that a city the size of Berlin survives with hardly any CCTV at all.